Anxiety in children is increasing. Research to understand how children develop in our world today is important. There is strong evidence that when children connect through play in a natural environment they are less anxious and the importance of play should not be limited to break times at school. 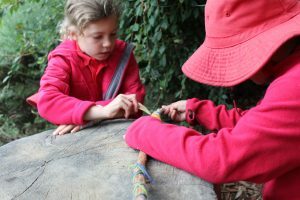 At Upper Sturt and in line with the Australian Curriculum General Capabilities we provide opportunity for play in nature which is then connected to personal learning. It is the essence of connection to a child’s real world where exploring and discovery are in their power and control. Teachers observe children playing, notice and record transfer taught skills, listen and hear their ideas and concerns, notice the way they communicate through their oral language abilities. During play, children also increase their social competence and emotional maturity. Smilansky and Shefatya (1990) contend that school success largely depends on children’s ability to interact positively with their peers and adults. Play is vital to children’s social development. (J.P. Isenberg & M. R. Jalongo) Read more. Project Based Learning (PBL) is developed from the area of personal interest for each child. It not only engages children in their choice of inquiry/discovery but is a very good way to improve independent learning skills. It requires responsibility, time management, research and presentation skills. Once the project is planned through conferencing and planning sessions, teachers facilitate and support each child to achieve their planned outcome. These projects are sometimes completed in groups, and sometimes individually. Our PBL is closely linked to BIO – Learning. BIO (Both Inside & Outisde) Learning is an integrated subject, which is employed as a whole school approach. Explicit texts are used for reading comprehension and modelled writing. Maths concepts are built in to the topic, and students have a chance to touch on multiple curriculum areas throughout the life of the topic. This format of learning is inspired by Talking Tubs and 3D Mind Maps. Talking tubs are used to encourage children to share their knowledge of a new topic and then ‘map’ or plan what they would like to learn. Following diagnostic assessment early in the year explicit teaching clinics are planned to support children to master new learning or specific gaps in learning. These learning pods provide access to learning across a range of year levels. They provide time for children to achieve specific and individual goals. 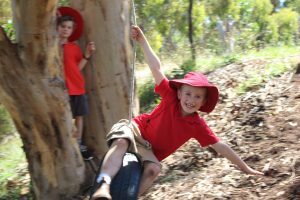 Play Pods are designated areas throughout our heritage bush which support our play based learning culture. Children use these pods to access realistic, age appropriate, and engaging learning ideas. Play based activities integrate with intentional teaching, complementing and enhancing it. Tuesday – Japanese with Reiko, Bow & Arrow Making with Evan. Friday: Ukulele Guitar Jam Sessions with Kevin, Art Club with Elizabeth, Robotic Lego with Peter. These sessions are from 3:30pm – 4:30pm and cost $12 per session (payable on the day). All welcome! Upper Sturt Primary School is on Facebook! ‘Like’ our page to receive our notifications in your feed; posts about up-coming events, exhibitions, ideas, and information.